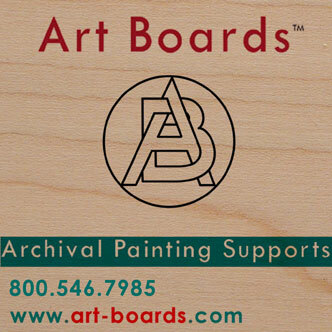 Art Boards™ Natural Maple Uncradled Painting Panel back has hanging slots. perfect back for the archival painting surface. Uncradled back with dovetailed hanging slots. Art Boards™ unique hanging slots enable the artist to hang their panel in either direction while working on their painting, or in the final presentation. This means that a single nail or screw in the wall is all that is needed to secure the painting to the wall. There is no need to frame, use picture wire or screw eyes. The panel can also be easily framed. The hanging slot interlocks with the nail or screw to keep the panel snug to the wall. The panel hangs flush to the wall, parallel and tight. The artist panel will not tilt away at the top causing it to angle away from the wall. The horizontal slot makes it easy to level. Simply slide the panel to either side left or right until it hangs level, even collages with un-equal weight distribution will level easily. The unique interlocking design holds the panel to the wall. Holding tight to the wall will help prevent damage to the painting. If a painting is not entirely secure to the wall it can be accidentally knocked off to hit the floor. Such an impact can cause irreparable damage. Maple Painting Panels are finely sanded and ready for Art Boards Panel Gesso. Art Panels are made in Brooklyn New York, USA. by Art Boards™ Archival Art Supply. Located in Brooklyn in the USA.